Welcome to Shamrock Farms. You Can Take a Tour! If you've lived in Arizona for any period of time, you'll recognize the company name Shamrock Farms. Their products are prominent in our dairy cases, our school cafeterias, hospitals, and in food service in general. What you might not know is that Shamrock Farms is headquartered right here in Arizona. It's a family-owned company, so you won't see it on NASDAQ and you won't see their profit and loss statement, but you'll see plenty of cows—about 10,000 of them—at the dairy farm in Stanfield, Arizona. Shamrock Farms is the largest family-owned and operated dairy in the Southwest. The farm operates on about 240 acres. The Shamrock Farms logo features a cartoon image of Roxie, who is the official "spokescow" for Shamrock Farms. Roxie confided in us that despite all the photos depicting the McClelland family history on the walls, she really runs the place. When the company was founded in 1922, it was known as Shamrock Dairy. Shamrock Dairy began in Tucson with only 20 cows and a Model T delivery truck. The processing plant for the dairy products is actually located in Phoenix. In 2003, Shamrock moved the farm to Stanfield, Arizona. Stanfield is in Pinal County, west of Casa Grande. Students from Stanfield Elementary School were the first to take an official school tour of the farm. The property in Stanfield purchased by Shamrock Farms is actually quite a bit bigger than 240 acres and will be used for future growth. The Welcome Center Barn is where tour groups assemble. The group heads meet the tour guide, who provides an overview of the tour, and some basic ground rules. You'll get on an open-air tram and start out on your one hour adventure. You'll see where Roxie and the girls live, with their modern cooling systems, the milking barn, and the calf nursery. Other tour highlights include Roxie’s Outdoor Adventure and Think Your Drink zone, where people can compare the nutritional value of milk versus other beverages. When you gather for your tour you'll see a sign with a picture of Roxie and a number underneath. That's how many calves were born just that day. Some lucky tour participants get to see a birth during their tour. One of the most popular parts of the tour is the one where participants can actually make contact with the calves. These youngsters (the cows, not the children!) will gladly accept a scratch behind the ears and some food that is provided by the tour leader. Shamrock doesn't buy cows from other farms. All of the girls have been born and raised at Shamrock Farms. The Shamrock Farms tour is appropriate for all ages. It is not especially strenuous. The ability to step in and out of the tram and walk a flight of stairs (with a handrail) will be your only requirements. There is an elevator for those that can't use the stairs. The cleanliness of this facility is striking. You'd think that with 10,000 cows, that there would be overwhelming odor. Not true. When you take the tour, ask them why. Having taken the tour, we believe that the people who'll get the most out of the tour are ages 8 and up. It isn't that there aren't things to do for the little ones—there's actually a ten minute stop at a special and very enjoyable playground. Still, this is more an educational tour than a tour where kids run around and play, as might be offered by some smaller farms. The Barn is not only the meeting place for the tour but it's also a place where you can learn about the history of Shamrock Foods and the products they make. There are photos and games and more. After your guided tour, you'll get a tasty treat (we won't ruin the surprise) and you can purchase Shamrock Foods ice cream. Want a souvenir with Roxie on it? Who wouldn't! Of course, there's a gift shop. Ice cream and souvenirs are all reasonably priced. Visitors are welcome to bring their own picnic lunch and use the indoor picnic area. For those people living in Chandler, or Ahwatukee, or other locations near I-10 south of Phoenix, it will take an hour or so to get to the farm in Stanfield. For those of you living in Surprise and Fountain Hills, it might be considered a day trip! In Maricopa, turn left onto Maricopa/Casa Grande Highway. There will be a blue Napa Auto Parts store on your left. If you go over the railroad tracks, you've gone too far. If you get to Harrah's Ak-Chin Casino, you've really gone too far! Continue east on the Maricopa/Casa Grande Highway for 3.5 miles. Turn right onto White & Parker Road (there's a big sign reading "Pinal Feeding Co."), cross over the railroad tracks, and continue south for about 9 miles. Turn right onto Clayton Road at the Shamrock Farms entrance sign. However long you decide it will take to get there, add at least another 15 minutes! You don't want to miss your tour, and there's plenty to read and learn while you are waiting. We estimate that from I-10 and Queen Creek Rd. it takes about 45 minutes. Here are the administrative details you'll need to visit Shamrock Farms. Tours are offered to the general public from early October through mid-May on the following schedule. They usually start taking reservations in September. Tuesdays and Thursdays at 1 p.m.
School field trips are scheduled on Tuesdays and Thursdays. Reservations are required if you intend to take the tour, which you can make online or over the phone. The charge for a Farm Tour in 2016 was $9 for adults, $7.50 for seniors (60+) and military, $6 for children 12 and under, and children under two (must sit on your lap) are free. Special events may have different pricing. Call about group rates or special tours for your group. If you have more questions, or to verify tour times and prices, visit the website or call 602-477-2462. 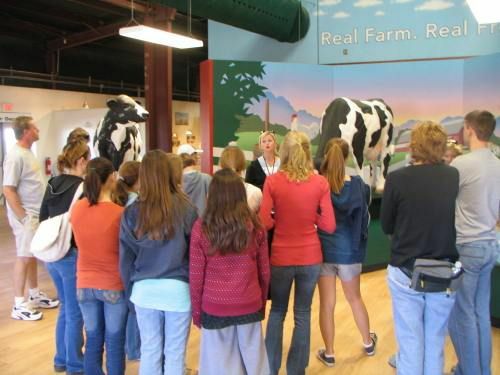 Shamrock Farm Tours are pretty busy, and tours are of a limited size. Check online for special events and deals.